The Dark Knight Rises is the third and final installment in The Dark Knight Trilogy helmed by British filmmaker Christopher Nolan—the first two being Batman Begins (2005) and The Dark Knight (2008), respectively. The movie’s screenplay is co-written by Christopher Nolan and Jonathan Nolan. The Dark Knight Rises pits the Batman (reprised by Christian Bale) against his greatest nemesis ever, the colossus, Bane—played by British Actor Tom Hardy. What makes Bane different from other villains of the Bob Kane universe is his ability to match the Batman both physically as well as mentally, for he’s trained by none other than Ra's al Ghul. 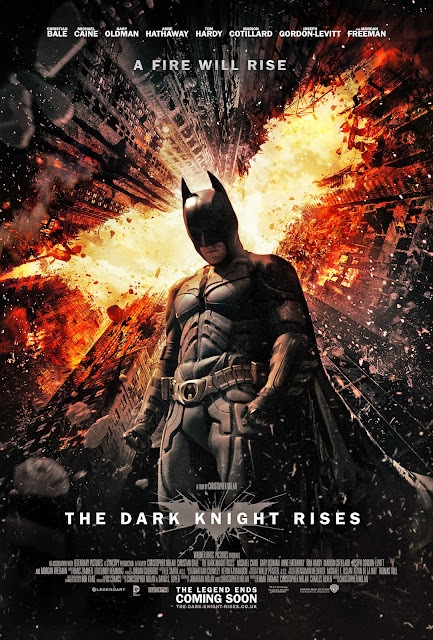 The Dark Knight Rises also stars Michael Caine, Morgan Freeman, Gary Oldman, Anne Hathaway, Marion Cotillard and Joseph Gordon-Levitt in major roles. Ever since the release of the teaser trailer back in July 2011, speculations have been rife as to whether The Dark Knight Rises would serve to be the fitting finale to Nolan’s Batman Reboot that the millions of fans rightfully deserve? Well, the answer is Yes… and No. Yes, Nolan does succeed in living up to his reputation of a masterful technician. He conjures up an ambiance that’s somber than ever. 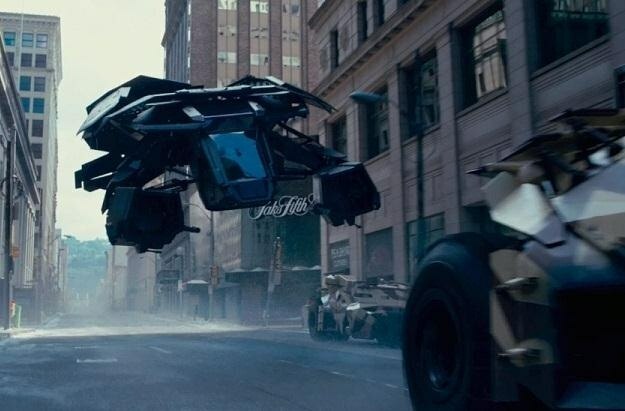 The CGI and VFX used in The Dark Knight Rises is state of the art as every minute detail has been meticulously taken care of. Unfortunately, the same cannot be said of the movie's other aspects. The one attribute of Nolan’s Batman Reboot that hitherto has made it superior to all the previous renditions has been the strong emotional connect that has been instrumental to the movie’s plot and character development. In Batman Begins it was this great conflict between duty and love that provided the movie with its real impetus. This conflict was taken to an all new level in The Dark Knight. 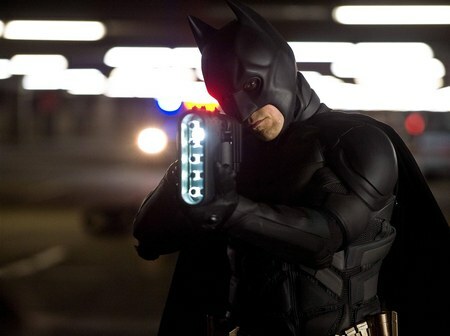 Unfortunately, The Dark Knight Rises suffers from an absence of purpose as makers seem to have run out of ideas. And, I am really sorry to say that the conviction has made way for desperation. But, it’s not at all surprising, for there’s a limit to which things can be stretched. Sadly, The Dark Knight Rises seems to be a product of producers’ whim rather than an artist’s expression. Christopher Nolan’s initial reluctance to direct a second sequel pretty much testifies the paradox associated with making a movie trilogy based on a comic character. Time and time again filmmakers have failed to keep up with the consistency of the first and the second movie in a superhero series. While The Dark Knight Rises is quite disappointing in comparison to its precursors, but it’s undoubtedly superior to the other superhero movies that are on offer: be it X-Men, Spider-man, or Avengers for that matter. 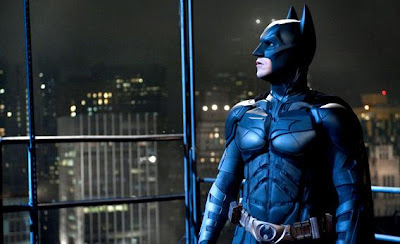 In fact, if it wouldn't have been for the high standards set by the previous two movies, The Dark Knight Rises would easily have passed for a great superhero movie. Another thing that the movie suffers from is the absence of a powerful antagonist. 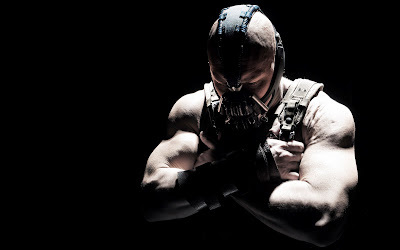 While Bane is touted as Batman's most formidable nemesis (as per his DC Comics' caricature), in my opinion, Bane (judging from his portrayal in the movie) lacks the qualifying traits of a quintessential Batman supervillain: be it the maniacal tendencies of the Joker (not to mention Joker's devilish sense of humor), the ruthless ferocity of Ra's al Ghul, or the schizophrenic impulse of Two-Face. Bane, like some of the other characters in the movie, seems to be gasping for air. He never seems to have the freedom of expression that a quintessential supervillain thrives upon. The mask that Tom Hardy's Bane perpetually wears seems to severely handicap Hardy’s ability to express himself as an actor. The only movie villain, in my opinion, to have grown creepier with a mask on is Darth Vader. Now that Nolan is done with the Batman Franchise we can finally expect some auteur-driven, avant-garde works from him on the lines of Inception (2010) and Memento (2000). Now coming to movie’s plot, the story picks up eight years after the events of The Dark Knight wherein the Batman had taken upon him the blame for all the evil doings of Harvey Dent aka Two Face in order to the exalt the later as a hero in the eyes of the citizens of Gotham. Since then Batman has gone into exile while the peace has finally prevailed in the city. 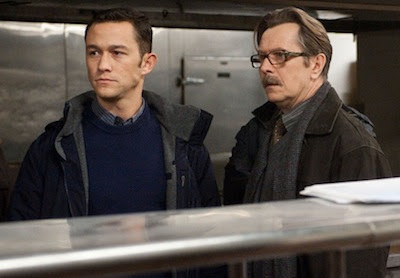 The Mayor of Gotham is so content with city’s safety that he plans to sack Commissioner James Gordon. Bruce Wayne has lost his mobility and strength as a result of his self-imposed exile and is forced to resort to a walking stick. 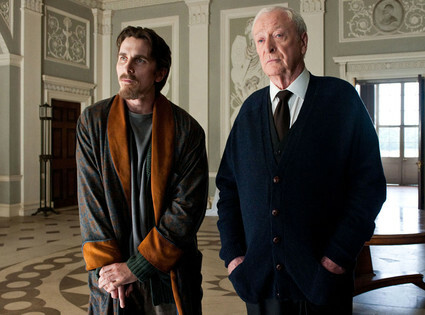 Wayne, however, is still looked after by his trusted butler Alfred who's more heartbroken than ever by Wayne's plight. 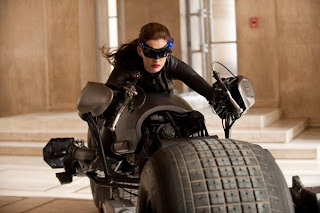 A mysterious thief named Selina Kyle robs a necklace from Wayne’s mansion as a handicapped Bruce Wayne fails to stop her. Apparently, Selina is secretly employed by Daggett, a major shareholder in the debilitating Wayne Enterprises, to steal a certain artifact from Bruce Wayne’s possession. 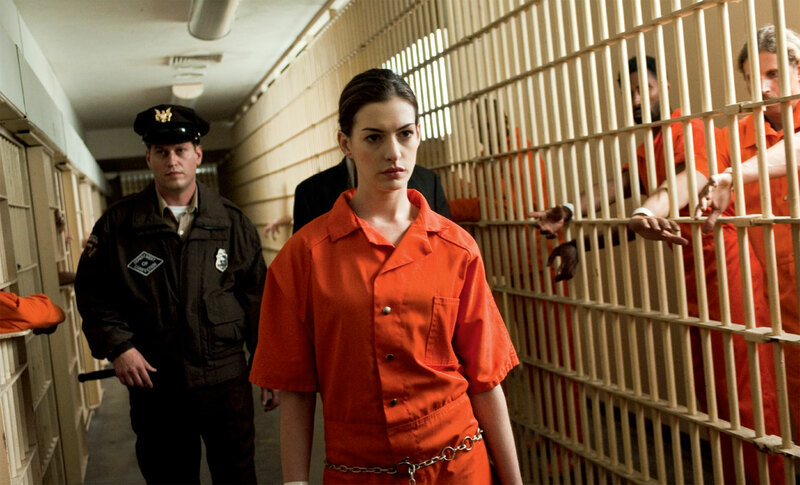 Miranda Tate, a member of the Wayne Enterprises executive board, seems to show a special interest in Bruce Wayne and wants to help him come out of his self-imposed exile and continue his father’s philanthropic works. A young cop named John Blake seems perplexed by the bizarre circumstances that had led to Batman’s banishment eight years back and wants to uncover the mystery behind it. Amidst all this there are rumors that a terrorist named Bane is breeding an army of criminals in the city’s sewers. 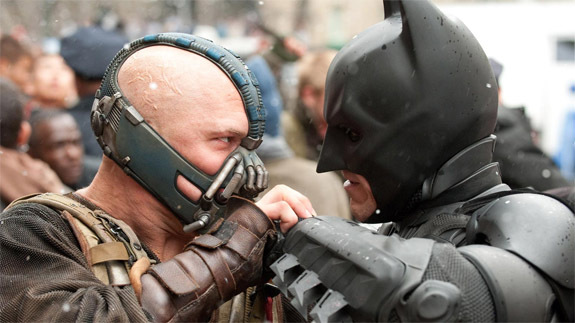 The only one who could possibly thwart Bane’s juggernaut is Batman. But, Bruce Wayne is in no condition to stop such a formidable opponent, neither physically nor mentally. When Bane attacks the stock exchange, Batman is finally forced to come out of his hiding. But, he has his job cut out as the police wants to arrest him for Harvey Dent’s murder. 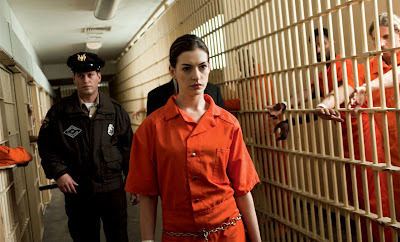 Batman succeeds in dogging the police and confronts Selina Kyle who helps him locate Bane. Batman is forced to surrender (after Banes breaks his back) to his superior opponent and is incarcerated in an ancient prison from where there seems no escape, not even in form of death as Bane is in no mood to deliver the coup de grâce, for he wants Bruce to witness Gotham's impending doom with his own eyes. With the Batman out of his way, Bane finally starts to unleash his master-plan of terror as the citizens of Gotham encounter their worst nightmare. Will the people of Gotham rise up to the occasion or will the greatest city in the world be burned to ashes by the estranged protégé of Ra's al Ghul? The all-pervasive uncertainty and mayhem finally makes way for the movie’s exhilarating climax as the loyalties and courage of movie’s different characters are tested with Gotham standing on the brink of annihilation. 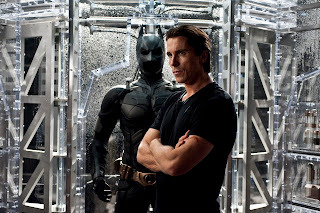 Christian Bale is his usual self (perhaps, a wee bit impassive than usual) as both Bruce Wayne as well as Batman. Tome Hardy as Bane seems frightening in flashes, but really fails to sustain the terror. His digitally enhanced voice often seems obnoxious. Anne Hathaway as the ravishing Selina Kyle is an absolute delight. She personifies the inherent mercurial nature of women, but even her character seems too superficial at times. Marion Cotillard as the enigmatic Miranda Tate looks as elegant as ever, but Cotillard doesn't get enough screen time to showcase her real acting talent which had won her the Oscar statuette back in 2008. 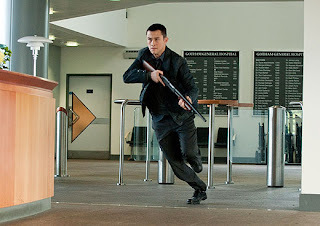 Joseph Gordon-Levitt as Blake, within his limitations, is quite impressive. Morgan Freeman as the techno-geek Lucius Fox is his usual self. Gary Oldman is solid as Commissioner Gordon, but I often feel that these Hollywood productions are a mere wastage of Oldman’s prodigious acting talent (for those of you who do not agree with me, I recommend watching Léon: The Professional and Tinker Tailor Soldier Spy). Michael Caine with his ever so impressive dialogue delivery and timing is by far the pick of the actors. The veteran actor remarkably makes every scene that he is a part of his very own. The rest of the cast gives good support to the main actors with special mention of Matthew Modine as Deputy Commissioner Foley and Cillian Murphy as Dr. Jonathan Crane. 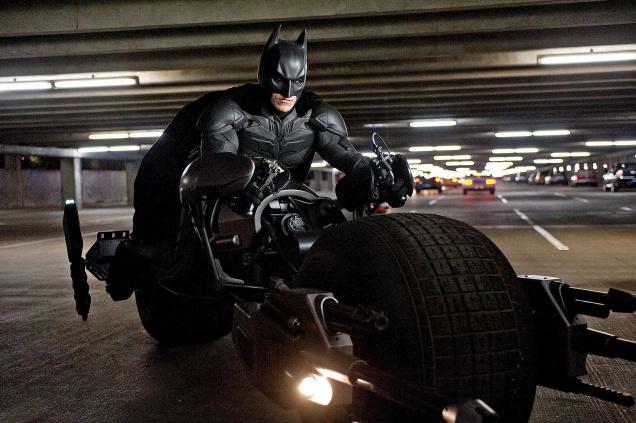 Overall, The Dark Knight Rises suffers from a loose plot and an excess of superficial characters. It wouldn't be a hyperbole to say that, given Nolan's usual standards, The Dark Knight Rises is a mere exercise in mediocrity. The typical Hollywood style ending further accentuates the maker's mediocre outlook towards the movie. But, if one overlooks these flaws, the movie serves to be a decent experience. 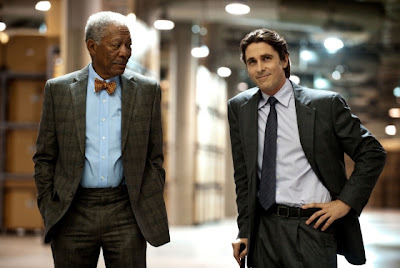 The Dark Knight Rises is a must for those viewers whose primary purpose is entertainment, but those who want to give their minds a rigorous exercise should try out some of Nolan’s other works like The Prestige (2006), Inception (2010) or Memento (2000). At 165 minutes the movie appears to be slightly long, especially considering the superficiality of plot and lack of character development. All being said and given what we have, The Dark Knight Rises is definitely not the Batman movie that we deserve, but it surely is a movie that we would find difficult to resist. Going by this review, I think I can book tickets for Sunday. I am going to watch the movie now. Let's see. Oh and great revamp of the blog, by the way. Loved it. Another great review:). Will have to watch it myself to see whether i agree or not:). But seriously speaking your writing style is commendable:).Really good:). Of Course, I wasn't disappointed on a whole. But, I had really high expectations which the movie unfortunately failed to deliver. It's just that I felt that the movie was much inferior to its precursors!!! Hello there, just became alert to your blog through Google, and found that it's really informative. I'm going to watch out for brussels. I'll appreciate if you continue this in future. A lot of people will be benefited from your writing. Cheers! I wish all the best to your project! You know what I feel about it already. Is it as good as Dark Knight ? No. Does that mean it is a bad news ? Again No. It is still a solid film. Given whatever we saw in first two installments, this is pretty much exactly what I expected it to be. Maybe you will find something more to like after you watch it again. For Nolan films, I usually do. Well, I am not very sure that it would be the case this time around, for The Dark Knight Rises is not a Nolan movie in its essence. The movie seems more like an attempt to make moolah at the box office rather than an effort to woo the fans of the genre. However, just for the sake of it, I still hope that the movie's second viewing would prove me wrong :-) . characters." It sounds a lot like what made the third Spiderman movie such a dud. After writing up my review I think I may have been a bit too harsh in my recent review of The Amazing Spider-Man. Not sure how some are claiming that you should not compare this to the other films in the trilogy or to Nolan's other work. Compared to those other films TDKR is the weak sister. This trilogy is the best screen treatment of Batman by far. "Rises" disappointed me a bit though, in that the Talia Al Ghul twist didn't satisfy and trivialized Bane, who had a great presence up until then. The acting was all top notch though. Hathaway was wonderful! I can't agree with you more, Brent. 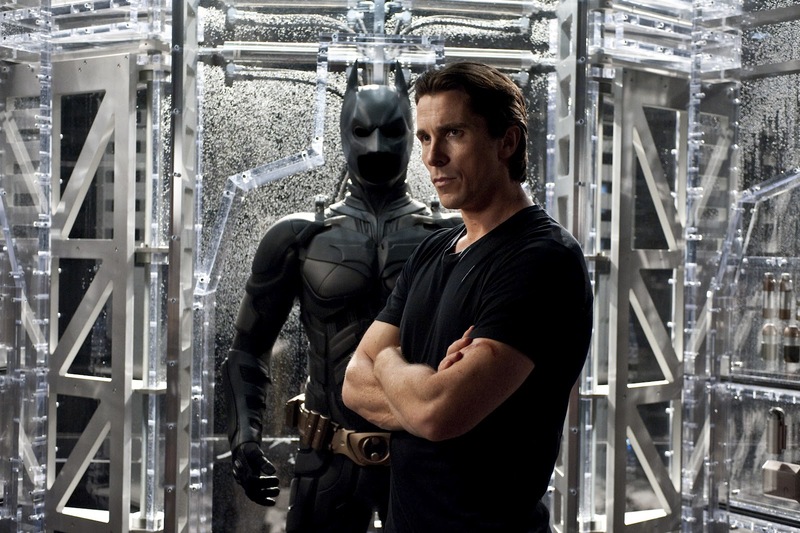 Nolan has indeed done wonders by transforming a mere myth (what the Batman used to be) into a legend. TDKR had its moments but it just couldn't live up to the high expectations set by the previous two films.